Originally approved and installed temporarily in honor of Gay Pride month in June, the rainbow crosswalks at Santa Monica and San Vicente Boulevards in West Hollywood are going to be made permanent. 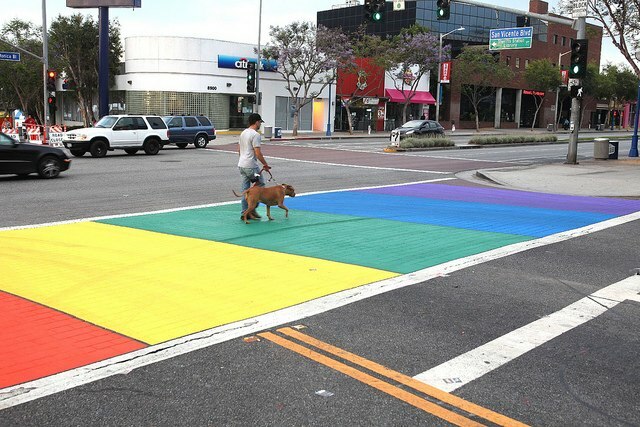 Thanks to their popularity and symbolism, the West Hollywood City Council voted Monday night to keep the crosswalks in all their rainbow-painted glory, according to Patch. With the decision to make the rainbow crosswalks permanent, the city will have the crosswalks regraded and apply thermoplastic pavement markings like is used in other crosswalks. That thermoplastic marking will be slip and slide resistant, is less likely to fade and cleans easily. The initial temp install ran the city $13,000, and the upgrade to permanent is estimated to cost about $67,000.